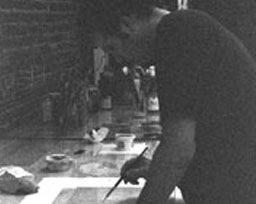 Wes Mills used the etching press at Aurobora sparingly — either to create bone-colored flats or circular stain-like marks– printing on cream-toned Strathmore paper or Chineese rice paper. These printed areas, which seem to simultaneously recede and pulsate within the paper field, became the initial springboard for Mills’s handwork — graphite line drawing, exacto knife-slits, and the adherence of archival hinging tissue. Mills’s monotype drawings are about paring down even the essentials to expose a point of entry for the viewer. Minimal use of color, form and line are directional signals towards the expanse and potential limitlessness that exist within (or left out of ) a composition. A small, seemingly errant scratch mark, a thinly drawn architectural line just off center, a cloud of crushed graphite hovering toward a corner, a spotting of color tone, all speak to a possibility (or a lost chance) of intimacy that these drawings invite.